Getting Out in Stowe — Without the Snow | Fit Families | Kids VT - small people, big ideas! You don't need a lift ticket to enjoy an outdoor adventure in Stowe. 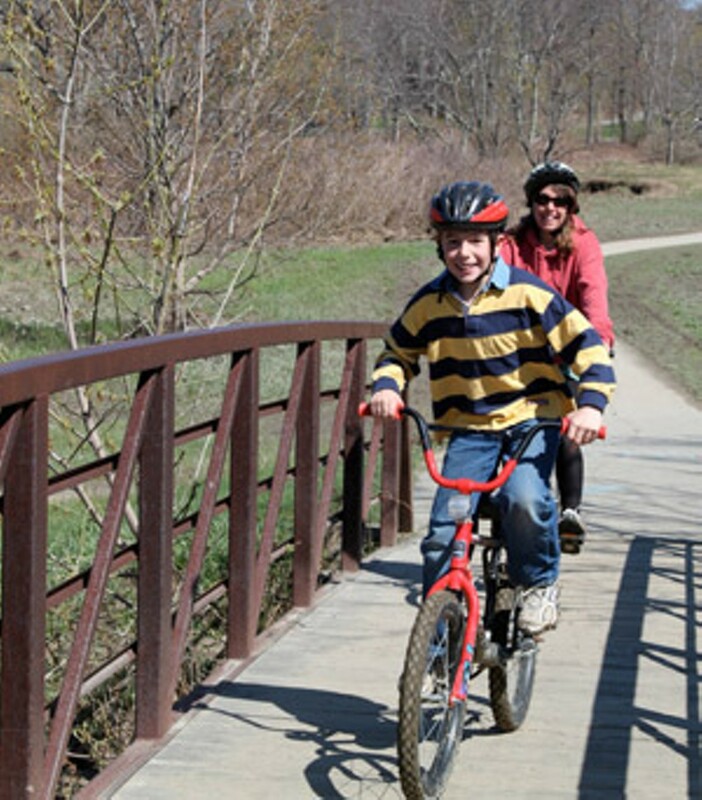 The Stowe Recreation Path, with its smooth surface and well-marked road crossings, is a wonderful environment for budding cyclists, parents pushing strollers and kids who use wheelchairs. If you only know winter Stowe, riding along the bike path will give you a new perspective on the resort community. The 5.3-mile route follows the West Branch of the Little River and is bookended by two of Stowe's best-known landmarks: the Topnotch Resort and Spa property at the northern end and the iconic white steeple of the Stowe Community Church at the southern end. Most of the path is 8 feet wide, with some portions as wide as 10 feet. The southern portion sees more traffic, while the northern is a better bet for a quiet ride. I met my 8-year-old nephew Noah and Aunt Megan, both of Worcester, at the southern start of the path on a sunny day in May. Noah had a great time pedaling over the bridges and talking with a young girl who was out biking. The path traverses farmland, forests and fields, as well as the Vermont Route 108 corridor, home to shops and restaurants. While you can get your nature fix, you're never too far from services in case the kids get hungry or need to use the bathroom. Plenty of flat, smooth stretches help build confidence in young bicyclists. There are occasional portions with a gentle slope — near the bridges, for example — where your child may want to get off his or her bike and walk for a few feet. No part of the path is so steep that it will induce tears or be discouraging. Just be sure to watch how far you've gone, and plan on covering a distance your kids can handle. For a full, fun summer day, pack bathing suits, towels and a lunch and have a picnic and swim along the shores of the West Branch. Thompson Park (also known as Tobe Reed Park), has parking, picnic tables, bathrooms (portable toilets) and swimming access. It's located off Route 108, across from Landmark Meadow and just south of Houston Farm Road — about the halfway point of the path. The cool water is a nice refresher and helps break up the ride. "Fit Families" is a monthly feature that offers easy and affordable ways to stay active. Got an idea for a future FF? Email us at ideas@kidsvt.com. Sky Barsch Gleiner is the owner and editor of Vermont Sports magazine and vtsports.com. She lives in the Northeast Kingdom with her husband and an ever-growing menagerie. Etiquette: Stay to the right, announce when you are passing someone; dogs on leash. Parking: Southern terminus: park behind the Stowe Community Church, 137 Main Street (Vermont Route 100). Along the path: at Chase Park (turn west on Luce Hill Road from Vermont Route 108, cross the river and the bike path); at Thompson/Tobe Reed Park. Northern terminus: Turn west on Brook Road from Vermont Route 108 (just after Topnotch), parking is about 200 feet on the left. Restrooms: Public restrooms are located on Depot Street (turn south on Depot from Main; bathrooms are in the lower level of the building on the right). Portable toilets are located along the path, in the main parking areas. Quick, reasonably priced food along the path: Piecasso Pizzeria & Lounge (1899 Mountain Road); the Shed Restaurant and Brewery (burgers, salads, house-brewed beer, 1859 Mountain Road); the Blue Donkey (burgers, 1669 Mountain Road); and the Bagel (bagels, sandwiches, 394 Mountain Road). If you're stocking up beforehand, try Edelweiss Mountain Deli (large-selection deli, 2251 Mountain Road) or Jamie's on Main (take-out sandwiches, salads and soups, 1 Depot Building, Main Street).